Digital signage and digital menu boards are rapidly becoming mainstream. You will start to see restaurants aggressively adopting this technology to enhance their business and customer experience. The most common application for digital signage in restaurants is digital menu boards, which provide great benefits, including reducing clutter, highlighting certain menu items and promotions, and displaying nutrition and calorie information. It was quick-serve restaurants that first adopted digital signage in the form of static images to provide these benefits. Soon more restaurants began leveraging this solution to organize their menu to display all menu options and feature certain menu choices. A picture is worth a thousand words, and walking into a restaurant and seeing a high-definition image of a featured menu item will not only promote the offering but also make it more appealing, increasing sales. Now, we are seeing a shift to digital signage in high-scale restaurants and everywhere in between. Today we are beginning to see different uses of digital signage in restaurants. Digital menu boards started off static, as a way to display the restaurant’s items in a collective and organized way. This strategy is becoming stale and ineffective. Restaurants are now trying to stay ahead of the industry norm and stand above their competition. Restaurants need to create a positive customer experience using digital signage. That way, restaurants are able to create a fun, unique and memorable experience to increase business and customer loyalty. In order for restaurants to stand out from their competition is to provide stimulating displays and videos throughout the restaurant, creating a unique and memorable atmosphere. Digital signage menu boards help restaurants maintain branding, run promotions and advertise to their customers. When a customer walks into a restaurant and sees a stimulating digital display with features and specials, this will only enhance their interest in those items. Positive experiences lead to repeat business and loyal customers. Restaurants also can use digital signage to enhance customers’ experience with customer loyalty programs or discounts. For example, an interactive social media strategy allows customers to comment on and share promotions, meal reviews or experiences during their dining experience. This method introduces a new way to attract customers and enhance sales. With any digital signage development project, there are key factors to consider when selecting the media player and content management service. Essential factors for digital signage include the types of content needing to drive the display (HD video, audio, multi-region messaging, etc. ), the number of video outputs (single or multi-display) and graphic capabilities. These factors are very important in a successful digital signage deployment. Overlooking any of these key elements could result in an unsuccessful project. For a restaurant digital signage deployment, there are many additional factors that must be considered in order for the solution to operate effectively. First and foremost, consider the environment where most digital displays are located within the restaurant. The solution will most likely be exposed to harsh conditions such as heat, dust, smoke, steam and possibly grease. You need to be certain that your media player solution will be able to endure this type of environment, but how can you be sure? Hardware is the framework that holds your solution together and drives your content. If any piece of the puzzle fails, then your entire solution fails. Hardware manufacturers can guarantee the conditions under which their media players can work. 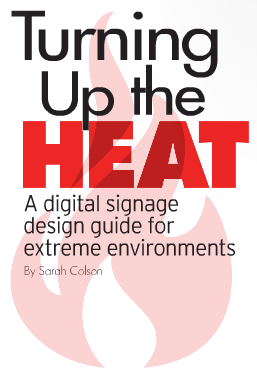 For example, restaurants need a solution that can run in extremely hot environments. And because restaurants are open for long hours, the media player must be able to work effectively the entire time. Guaranteeing the temperatures and conditions your media player solution can work under could mean the difference between a successful or unsuccessful project. Performance should not be jeopardized based on the environment of your project. Considering these environmental conditions can make or break the project. Restaurant digital signage will continue to expand, and having a solution that can operate successfully in these environments will become more and more important as the industry grows.